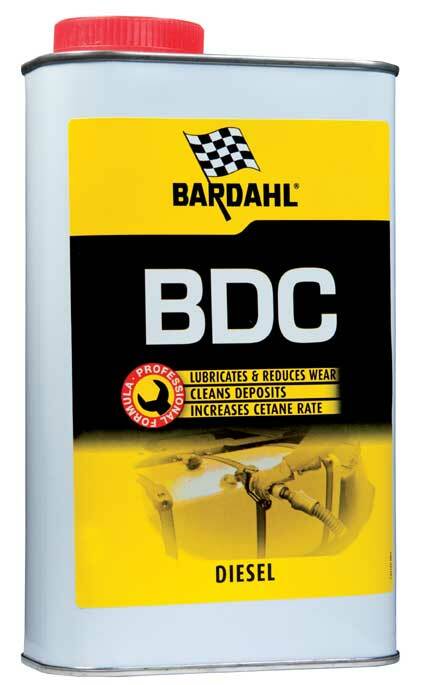 To avoid moisture in the diesel add Bardahl BDC. Prevent moisture and bacteria in diesel. Bacteria can, with too moisture in diesel, grow and cause major problems in fuel tanks and fuel filters. 1. 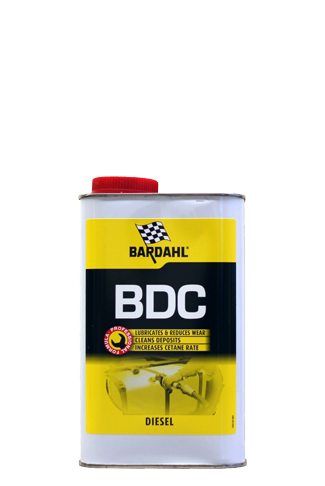 Bardahl BDC prevents moisture in diesel (and so bacteria is kept away), increases the cetane rate, improves the lubricity and more. 2. When you have a lot of moisture and bacteria in the diesel you can remove this with Grotamar 71®. More and more biodiesel is added to diesel fuel. Also there is much less sulfur in fuel than before. This makes the fuel leaner and reduces lubrication. From the environmental point of view, the addition of biodiesel and the reduction of sulfur in fuel are nice developments. However, in practice, supplying biodiesel and reduction of sulfur cause major problems, which eventually can lead to bacterial growth in the fuel tanks. How can the above occur? Biodiesel attracts up to 8x more moisture than regular diesel. Moisture is a first source of potential problems. How rises moisture (water eventually) in the fuel tank? Temperature fluctuations, dark rooms, long storage (for example after winterperiod) and poor sealing of the fuel filler neck gives moisture/ condensation enhance a chance. There is always a percentage moisture in fuel. Diesel can include up to 0.02% of water, without loss of quality. If there is more than 0.02% moisture in the diesel, this will slowly sag to the lowest point of your fuel tank. Too much moisture / water reduces the lubricity of the diesel fuel, and will ultimately lead to bacterial growth. These bacteria must be removed before they can clogg the fuel filter. If fuel filters are clogged completely this means that your engine is no longer running, with all its consequences. To minimize the percentage of moisture in the fuel there Bardahl BDC. However, use of BDC gives more benefits as you can read below. Do you have bacteria in diesel and do you want to remove it? Use first Grotamar 71®. 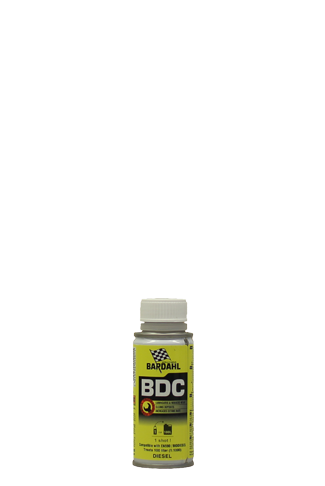 Is the fuel clean and free of bacteria, than you can switch to Bardahl BDC. - In winter we advise a mixture of 2 liter for 1000 liter diesel. 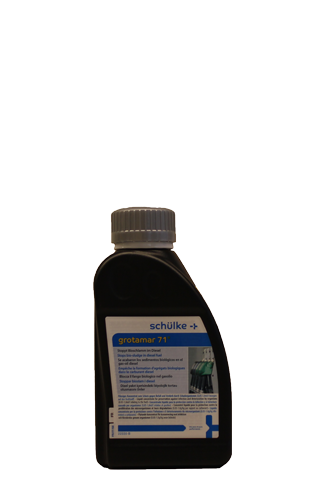 Grotamar 71® is an effective biocide specifically developed to remove bacteria from the diesel. Bacteria can clog the diesel filters. In the best case, the fuel filter is only partially blocked, but often bacteria will Block the filter fully and that means that the engine is not running anymore. The risk of engine damage and damage to the high pressure pump is hugh. Half a cup of water in 1000 liters of diesel is enough to start the microbiological growth process. Water is insoluble in diesel, especially in a hot and humid environment. It condenses out of the diesel and air in the tank when it is cooling off. Droplets are formed on the bottom of the tank and on walls in the fuel pipes. The biosludge can cause engine failure or damage due to clogged filters and injectors. Microbes can cause rapid and severe corrosion of tanks and components of the fuel system. Grotamar 71® stops microbial growth and biocorrosion. Grotamar 71® is added directly to the fuel. With a shock dose Grotamar 71® kills the microbes in the fuel, water and biosludge of contaminated fuel. Grotamar 71® has been tested by leading manufacturers such as MAN, Daimler and MTU and is suitable for all diesel engines and pumps. If possible, remove all water from the tank before adding Grotamar 71®. Add Grotamar 71® to the tank when the tank is about one third full; the product mixes best in this way when the tank is filled up. Grotamar 71® starts working immediately after adding. The amount of product to add depends on the amount diesel which has to be treated. Is the diesel completely contaminated with visible sediment, or is there a technical failure such as a filter blocking? Use a SHOCK DOSAGE. If possible, remove 24 hours after the treatment with Grotamar 71®, the remaining water and the biosludge. In case of large amounts biosludge you have the clean fuel system (tank, fuel lines and filters) before using Grotamar 71®. When you do not clean the contaminated tank before a treatment, then it is possible that you have to place new fuel filters soon. They might get clogged with biosludge that Grotamar® 71 has removed from the fuel tank and fuel pipes. Is your diesel free of bacteria and you want to keep it clean? Use Bardahl BDC. This keeps the diesel clean, moisture is kept away, the cetane rate will increase and the efficiency of the engine will increase and is better lubricated (important because of the decrease of sulfur content). The result: the performances will increase and the fuel consumption will decrease up to 3%. Do you have bacteria? Add Grotamar 71® to the fuel.